You’d think it would be a bigger shock: One of the richest artists in the world severs his ties with the world’s most powerful art dealer, after 17 years of working together. But the collective shrug with which the art world has greeted Damien Hirst’s departure from Gagosian, the mega-gallery based in New York but with outposts worldwide, suggests two things: that nothing Hirst does surprises us anymore, and that he may not be in the business of art at all. They were a perfect pair, Damien and Gogo: the impudent British trickster and the smooth American wheeler-dealer, each of them in his way elevating the art of the deal above art itself. It was less than a year ago that Hirst and Gagosian foisted onto the world their enormous, absurd eleven-gallery exhibition of Hirst’s “complete” spot paintings, with the artist’s innocuous abstractions filling every one of the dealer’s spaces in what seemed less a presentation of Hirst’s work than an advertisement for Gagosian’s reach. (Who knew he had a space in Athens?) Lacking a private plane and with a masochistic streak that only runs so deep, I subjected myself only to three of the spot-painting shows. They were so anodyne I couldn’t even bother to get angry about them. “Some weird meme for the impossibly rich that nobody knows how to stop,” another critic called them, and that’s about right. Hirst really did have a major impact in the days of Young British Art, enough so that it’s of secondary importance whether anyone actually likes his later works. He’s simply there, a big shark in a small tank, forcing even those who aren’t interested to pay attention and even those who don’t like the work to put in on their walls. 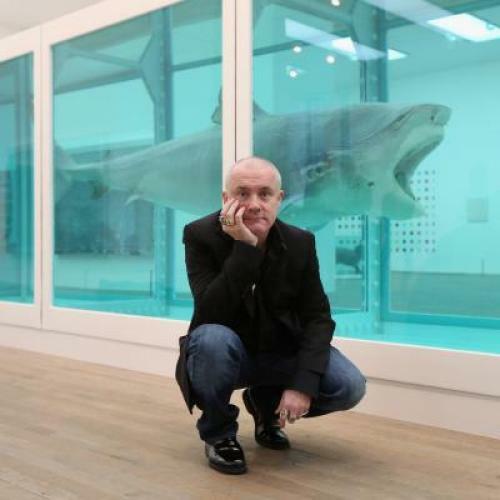 Hirst has always been impervious to critical attacks or even to his collectors’ own distaste; he is, like a shark, in perpetual motion. In 2009 I forced myself to visit the Wallace Collection, one of my favorite museums in London, which Hirst had invaded with sub–Francis Bacon paintings of skulls and sharks and spots, complete with cliché gold frames. They were the sort of thing you might expect from a not particularly gifted high school student working out his teenage angst on canvas, and the British critics flayed him for it. No matter: He sold every one of them. The memory of his more significant work from the early 1990s, and the halo of respectability that money provides, was more than enough to get the work into a Dubai penthouse or a vault at the Geneva Freeport. It’s true that the market for Hirst is going south—depressed, so the consensus goes, by his massive straight-from-the-factory auction of 223 works at Sotheby’s on the very day that Lehman Brothers collapsed. Gagosian hated the idea, not only because he was afraid Hirst was flooding the market but because the dealer wouldn’t be making any money on it. But Hirst has always been mindful of the vicissitudes of the art industry, and he’s written about it with an admittedly welcome openness. “The first time you sell something is when it should cost the most,” he has argued. Like a new car you drive off the lot, says Hirst, a work of art should depreciate over time, its financial value decaying as thoroughly as the maggot-strewn cow’s head in his 1990 sculpture A Thousand Years. Whether this is an economic principle or an ex post facto justification for his poor secondary market performance—an average loss of 30% since 2008, at least for those works that find a buyer at all—is hard to say. But who cares? In Hirst’s model, it doesn’t matter if collectors make a poor return on their purchase, since the lion’s share of the cash all goes to him and there’s always new money around the corner. Hirst will still be represented by White Cube, the gallery based in London but with outposts in two of the four BRICs; they’re mounting a Hirst show in Hong Kong next February, and at Art Basel Miami Beach last week they quietly presented a few Hirsts, with mixed fortunes. He retains the support of the Mugrabi family, the mega-collectors who own more than 100 works of his. And it remains possible that Hirst could end up with another New York dealer, though I wouldn’t bank on it; the other major galleries in Chelsea would probably do more harm than good to their reputations, and thus their bottom line, if they took him on. It seems more likely that Hirst will use White Cube and occasional museum shows in the way that fashion houses use haute couture presentations: as expensive loss-leaders to pump up the price of ready-to-wear, where they make the real money. In this way Hirst is wholly different from Jeff Koons, another stratosphere-occupying artist whose own future with Gagosian is in question. You cannot get a discount Koons; pay $20 million or go home. Whereas Hirst has opened his own shop, Other Criteria, where he moves signed posters and schmattas with unreserved glee. Hirst will sell you a backpack co-designed by the Olsen twins for a cool $55,000, or if you’re not feeling flush, you can go for the $12.50 key ring. When he was promoting his spot painting exhibition this year, Hirst showed a camera crew around his massive production facility in Gloucestershire, where he pays his fabricators by the hour. He insisted: “People forget that, you know, factories don’t only make dog food. They make Ferraris as well.” Which is true—but then again, Ferraris and dog food are both not art, and Hirst, not just critically but economically, is no longer an actor in anything recognizable as artistic practice. He is much closer to the luxury fashion houses or jewelry companies that glom onto the art world in search of collectors’ remaining millions, and he probably doesn’t need a gallery any more than Louis Vuitton does. Because the really depressing thing about Damien Hirst, the thing that should terrify us most about the state of the art world, is that neither low quality nor low profitability is enough to stop him. A depressed market can always be mitigated through volume, we are learning, and his transition from artist to luxury brand is less a retreat than an apotheosis.